Fire engine red traffic cones in 18 inch reflective and non-reflective from JBC Safety. Make your private parking lot, parking garage or valet area stand out from the rest with bright, candy apple / fire engine red traffic cones. These red cones are 18″ high and available with or without reflective collars. If you plan on using them at night, order the reflective cone. 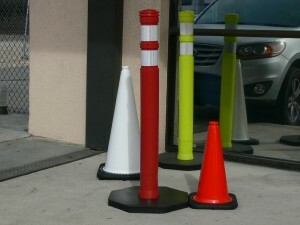 Red cones are an ideal for coning off a hazardous area or anywhere danger may be present. Excellent for use in the oil drilling, fracking and gas well drilling industries. **NOTE** In direct sunlight these are almost identical to the orange cones. The red really shows up under cloudy conditions or indoor use. If this red traffic cone matches your company, school or team colors, you are in luck. You have now found another eye catching item for your company or team logo. If you are a sports team, just imagine the number of fans on game day that will see these red cones with your team logo instead of the same old orange traffic cones in your parking lot. Unique red cones will definitely catch their eye allowing you to brand your image.